Oh, my poor gut. The things I subject it to: Hamdogs, Turduckens, and Food Stadiums, oh my. 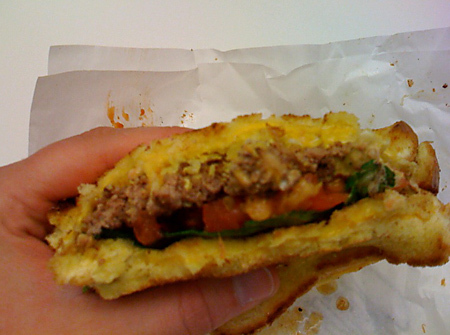 Today I reached a new low after sampling Portland’s newest food fad, the Fatty Melt, aka the “YouCANHasCheeseburger.” Quite simply, it’s your basic 100% Black Angus cheeseburger, complete with lettuce, tomato, onions, ketchup and mustard. Only, instead of buns, substitute two grilled cheese sandwiches. One for the top bun, one for the bottom. I don’t even want to think about how many calories that is. 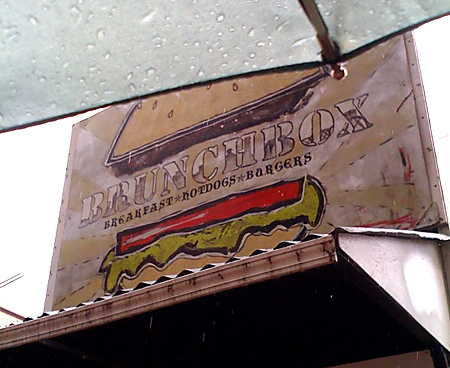 The sandwich is available downtown at BrunchBox for the value- and calorie-heavy price of just $5. Breaking it down to its individual components, you’re looking at two one-dollar grilled cheese sandwiches straddling a three-dollar burger (take that, Carl’s Jr.). That’s enough to feed a very small family amply, or to put one “knowledge worker” on the fast train to Type II Diabetes. Of course, the calories only count if they are actually tasty. And in this case, they are. 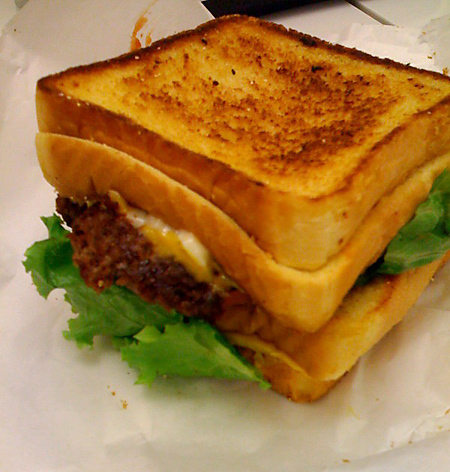 The crispness of the fried Texas Toast complements the crunch of the lettuce nicely, and the oozy cheese in each of the sandwiches meet the softened cheese atop the chewy beef patty in the tastiest triumvirate since the Dahm Triplets. It’s easy for food spectacles (or “Meat Stunts,” as we like to call them) to eschew good taste in pursuit of extremity, but this is one tasty sandwich, and I really don’t feel that gross. Not nearly as gross as I felt after I took on the Baconator. YUMMYY! That sandwich looks soooo tasty! Cool blog! Now that’s a heart attack sandwich! All you need is a X-Large Diet Coke to wash it down with! Next Next post: Dr. Wort … Unmasked!